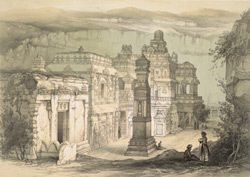 This is plate 18 from James Fergusson's 'Illustrations of the Rock Cut Temples of India'. The caves of Ellora near Aurangabad are a landmark of Indian art, bringing together Buddhist, Hindu and Jain temples on one site. Fergusson's picture shows a masterpiece of Hindu architecture, Kailasanath. The most famous of all the splendours of Ellora, this is a free-standing temple rather than a cave and is sculpted entirely out of a great mass of basalt. Patronised by successive rulers of the Rashtrakuta dynasty from the middle of the eighth century onwards, it symbolises Mount Kailasa, the abode of Shiva. A tall screen marks the entrance, and sculpted river goddesses on an elephant-borne plinth mark the route to the three sections of the temple: a Nandi shrine, a mandapa, and the main sanctuary. The principal shrine is topped by a pyramidal tower (shikara). Superb sculptural friezes in the temple depict tales from the Ramayana and the Mahabharata, as well as the deeds of Shiva.